Venger Wind and US renewable distributor SWG Energy just installed the world’s largest rooftop wind farm atop the Oklahoma Medical Research Foundation (OMRF) in Oklahoma City. 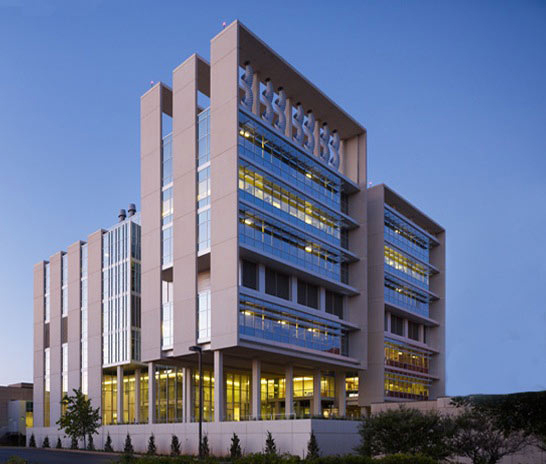 The project saw Venger Wind construct 18 V2 vertical axis wind turbines on the medical center’s roof as part of OMRF’s sustainability strategy to create a zero emissions research tower. The omni-directional wind turbines have been integrated into the design of the building and precisely positioned to collect wind from both the North and South sides of the rooftop farm. The installation of the 18 wind turbines makes the entire project the largest building integrated wind energy system in the U.S. Unlike most vertical wind turbines, which are relatively modest in size, the V2 wind turbines are massive. They stand 18.5 feet tall and are rated at 4.5 kilowatts each. Unlike conventional wind turbines that use energy from the grid to start, the vertical turbines start producing electricity at 8.9 mph, which is well below Oklahoma City’s annual wind speed average. Venger Wind is a global clean technology company engaged in the design, manufacturing and marketing of small wind turbines developed to generate clean electricity. Their V2 turbines are based on the work of Finnish engineer Sigurd Johannes Savonius who first invented the Savonius wind turbine in 1922. Click here to view a video of the installation of the turbines. At this tiny scale of 4.5 KW wind generators, horizontal-axis triblade wind turbines do not require electricity to start. Modern wind turbines which generate 200 to 2000 times the electricity often draw energy from the grid due to the inertia of the blades. Small wind generators do not. Secondly, wind energy is distributed generation. It's disingenuous of Mr. Morgan to assert that wind energy is installed a long way from population. Compared to the hundreds and thousands of kilometers that electricity is transmitted from dams, major coal plants and nuclear plants, most wind farms are very local to use. They are tied into the distribution grid, not the transmission grid, and their electricity is first used by local consumers, then by nearby consumers and then by remote consumers. Unfortunately, proponents of generally less cost-effective vertical-axis wind turbines often resort to attacking wind energy, possibly winning the battle, but helping anti-wind lobbyists win the larger war. And for the record, these designs are not wind turbines, but a modern variant of a Savonius windmill. There are small niche areas where they have a slight advantage over horizontal axis wind turbines. This one, where the aesthetics are nicely integrated into the building is one, as the aesthetic value makes up for the much greater lifecycle cost of electricity that inefficient Savonius-designs invariably result in. Venger Wind and US renewable distributor SWG Energy just installed the world's largest rooftop wind farm atop the Oklahoma Medical Research Foundation (OMRF) in Oklahoma City. 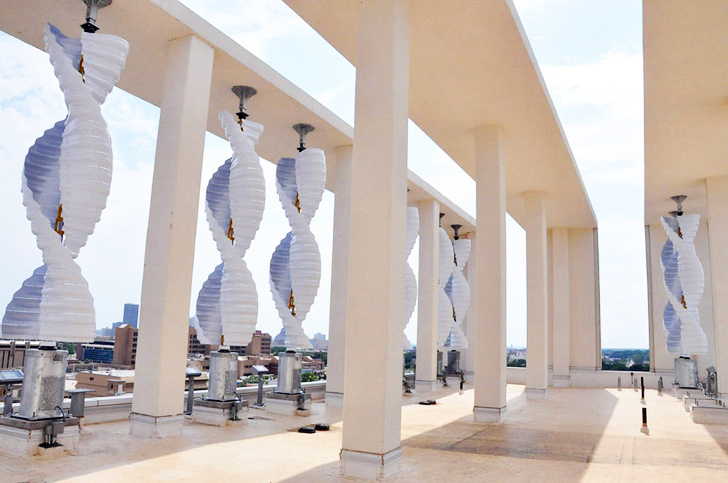 The project saw Venger Wind construct 18 V2 vertical axis wind turbines on the medical center's roof as part of OMRF’s sustainability strategy to create a zero emissions research tower.